February is the month of LOVE. At Beautyologist, we love our clients, and wanted to give you all a little token of our appreciation & adoration for you. 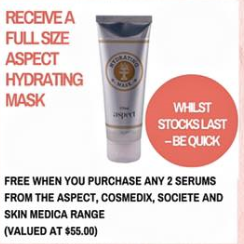 While supplies last, we’ll give you a FREE full-sized Aspect Hydrating Mask when you purchase any 2 serums from any of the following skincare ranges: Aspect, Cosmedix, Societe Clinical, and Skin Medica.